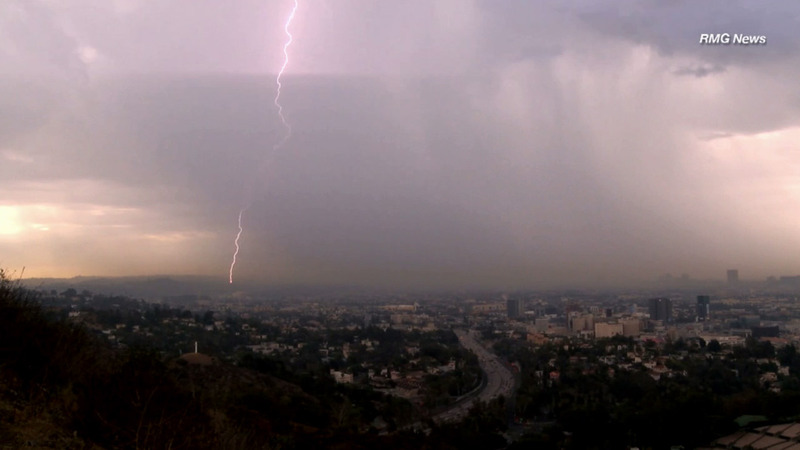 LOS ANGELES (KABC) -- A series of storms brought on by El Nino are expected to sweep across Southern California. The first in at least four storms is expected to start as early as Sunday night, according to the National Weather Service. It should bring about three-quarters of an inch of rain and as much as 4 inches of snow at elevations above 6,000 feet. The storms are expected to impact Monday's morning commute, and drivers are advised to monitor road conditions and the latest weather reports, especially for those who are traveling in the mountain areas. One of the larger storms should strike on Tuesday, bringing as much as 2 inches of rain to the coasts and valleys and 4 inches to the foothill and mountain communities. At elevations above 7,000 feet, about 2 inches of snow is expected, with lighter amounts at elevations below 6,000 feet. The NWS warns of potentials for flash floods and debris flow in recent burn areas with Tuesday's strong storm. There will also be gusty winds. A winter storm watch has been issued for Los Angeles County, excluding the Santa Monica and Ventura County mountain areas. A watch means there is the potential for dangerous weather, such as flooding and strong winds. The NWS could upgrade the watch to a warning depending on the intensity and timing of the rain storms. High surf advisories have also been issued for the Los Angeles and Ventura county coasts until Thursday night. Additional storms are also expected Wednesday through Friday, but they should be smaller. They have the potential to bring brief, heavy downpours.